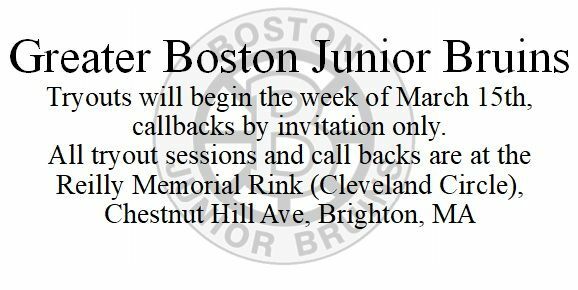 The Greater Boston Junior Bruins will be holding their annual uniform and apparel fitting day on Thursday May 2, 2019 at the Cleveland Circle Skating Rink, 355 Chestnut Hill Avenue in Brighton (please use side door). Fitting is for apparel and equipment only. The on-line store will be up and open shortly. Remember when you have items embroidered make sure player’s size and embroidery player’s # are correct. Any team desiring to be considered “National Bound” CAN NOT hold tryouts until 24 hours after the conclusion of the 2019 National Championships, meaning that this year’s tryouts may not begin before April 8, 2019. (use USA Hockey Registration tab on our web site).